Visitors at the Kuala Gandah Elephant Sanctuary enjoy feeding the elephants! Massive and intelligent, powerful and gentle. The elephant captivates everyone, young and old. It’s no wonder tourists flock to the Kuala Gandah Elephant Sanctuary (National Elephant Conservation Center) in Langchang, Pahang for the chance to marvel at and interact with these majestic animals up close. A two-hour drive away from Kuala Lumpur, the conservation center has long been an accessible place to see endangered Asian elephants. Established in 1989, it the most popular elephant sanctuary in the country, ever since its existence has been publicized in 1997. Facing serious threats from deforestation and poaching, there are less than 3,000 Asian elephants left in Malaysia. There used to be large numbers of elephants across the country, but that amount has sadly dropped tremendously over the last 25 years. The fragmentation of forests caused by urbanization and clearing for agriculture – without the provision of natural corridors – has led to increased elephant-human conflict, wherein wild elephants raid oil palm plantations. The conservation center is tasked with capturing these rouge elephants, rehabilitating them at the sanctuary, and relocating them to national parks such as Taman Negara. Domesticated elephants demonstrate their skills and intelligence. See eye to eye with the endangered Asian elephant. While I prefer admiring elephants in the wild, sanctuaries such as these are educational venues for more people gain a greater understanding and appreciation for these animals and learn about their plight. A visit to the center begins with a film showing about elephant conservation at the theater of the main hall. There are also scheduled educational shows held at an outdoor arena that demonstrate the power and skill of rescued elephants. These are domesticated animals utilized in the rescue and rehabilitation of wild elephants. These shows culminate with the much-awaited opportunity for visitors to hand-feed the elephants with papaya and other fruits. 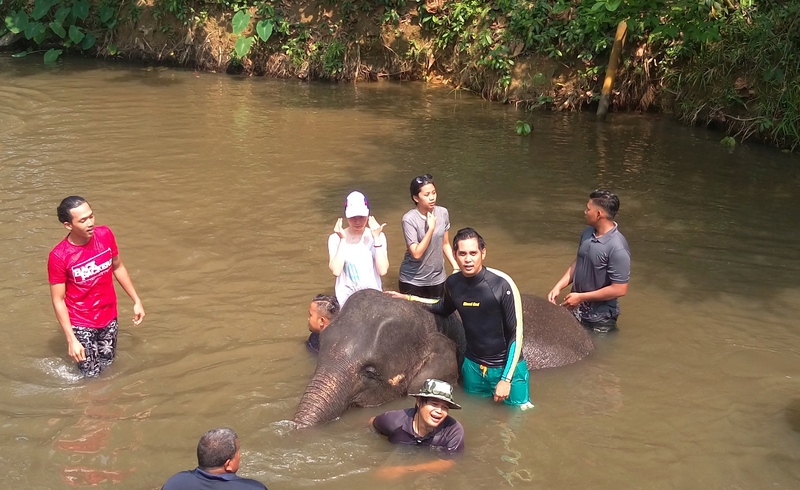 The highlight of my visit was bathing a baby elephant in the river! Besides feeding the elephants, the most exciting activity is getting the chance to bathe a baby elephant in the nearby Teris River! After every show, the elephants are led to the river for bathing. Our enthusiasm overcame the sight of elephants pooping in the coffee-colored river, and we delightfully waded into the waist-deep water to join the mahouts and their elephants. Scooping up sand from the river bed, we scrubbed down the bristly back of a juvenile elephant who seemed to enjoy all the special attention it was getting. We rinsed off the sand by splashing water on the animal (and each other! ), which was a great excuse to cool off in the midday heat! Indeed, it was an awesome time for both people and pachyderms.